Manufacturing organizations are always looking for ways to improve productivity, eliminate waste, improve quality and shave costs. While many companies might say that their people are their greatest asset, it's surprising how many organizations do a less than ideal job of effectively hiring the right people for the job. In this whitepaper, we discuss how top manufacturers significantly impact their bottom lines through effective employee selection. know who you are - what's important in your organization? 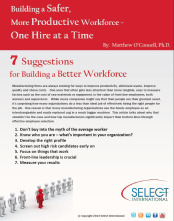 Download this whitepaper to learn about these and other actionable tips to help you build a safe, productive workforce - one hire at a time. Simply complete the form on the right to download.